There is more to the French Riviera than sunny beaches, skimpy bathing suits, oversized yachts, and a world-class film festival. The stretch of coastline that extends from Saint Tropez to the Italian border also stands for scientific research and high technology. Located a few kilometres north of Antibes, Sophia Antipolis—a French equivalent of California's Silicon Valley—is home to more than 2,000 companies, most of them high-tech, and scores of laboratories, research institutes, public universities and engineering schools. 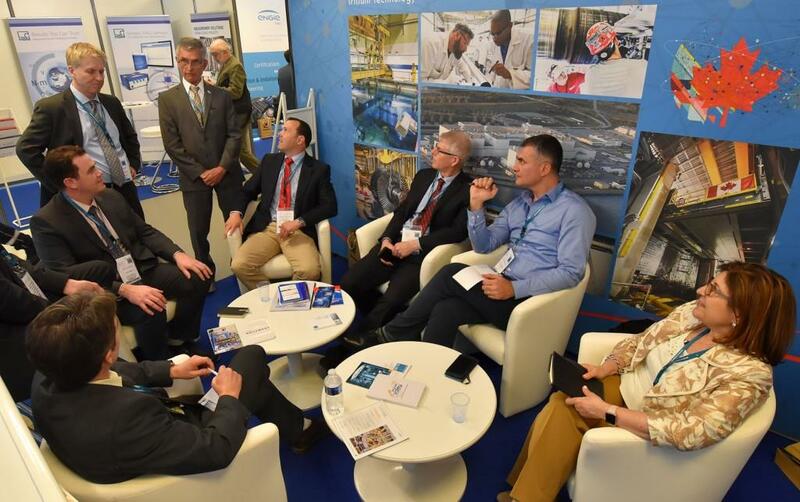 Last week, as Sophia Antipolis celebrated the 50th anniversary of its creation, more than one thousand industry representatives gathered in nearby Antibes to meet with ITER stakeholders and hear updates on the project's progress, needs and upcoming tenders. 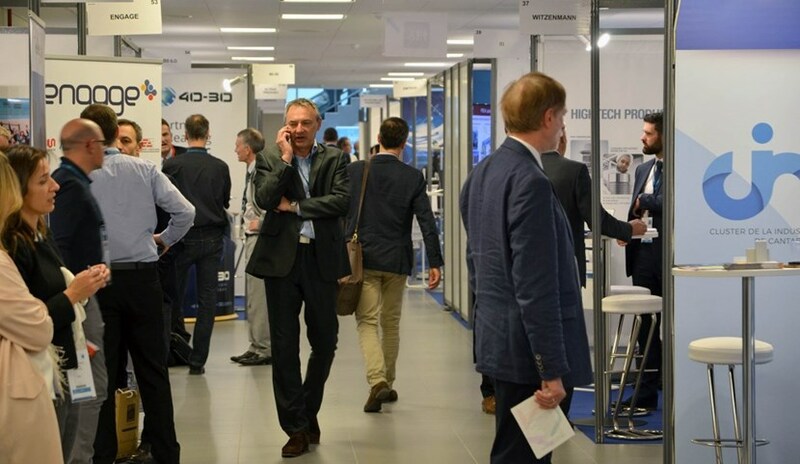 IBF/19 established a new record, with 1,110 participants from 484 companies, 80 exhibition stands and more than 1,200 formal business-to-business meetings. Since its first edition in 2007 in Nice, France, the ITER Business Forum (IBF) has grown dramatically in scope and attendance. 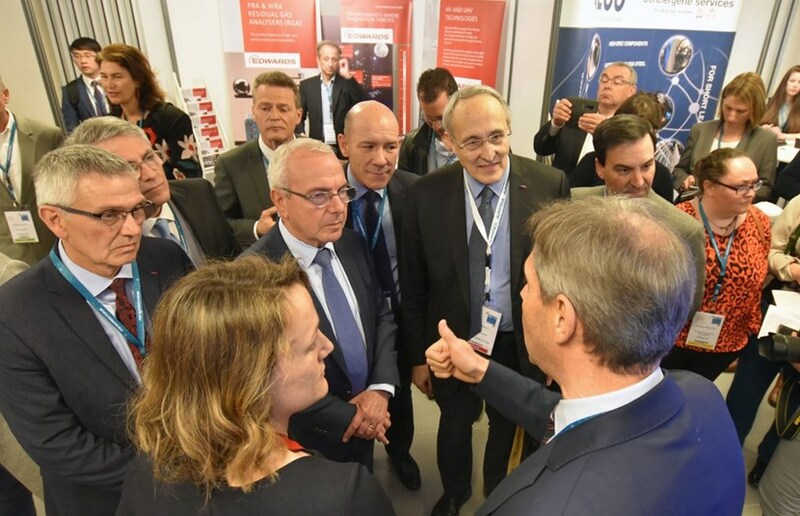 IBF/19, organized in Antibes on 27-28 March by Agence Iter France¹, was attended by the representatives of close to 500 companies and research institutes from 25 countries (1,110 people in all). The ever-increasing number of participants is not the only measure of success, however. What was palpable during the two days of presentations and business meetings was the intensity of the interactions—ITER and the world industry have now found a common language. 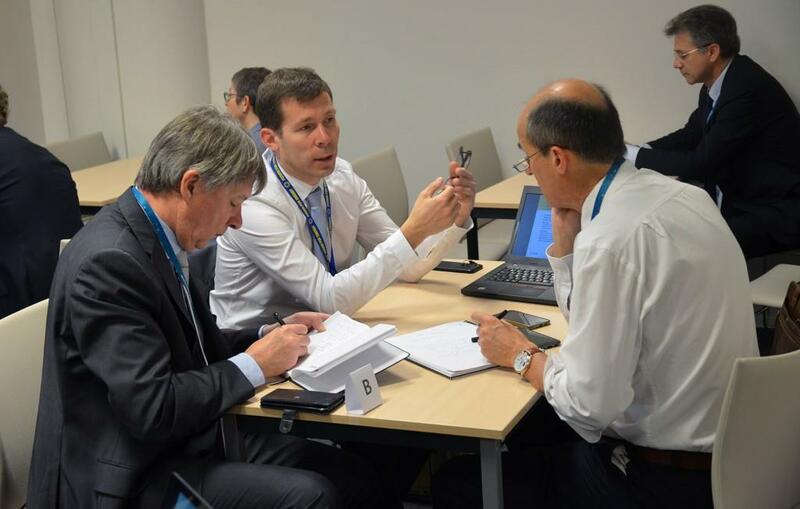 "When they see the pictures of worksite and manufacturing progress, industry representatives gets a clear message: ITER has now entered a very decisive phase and industry has a key role to play," says ITER Divertor Section leader Frédéric Escourbiac, his pockets filled with the business cards collected during the two-day forum. "What we have seen in the successive editions of IBF is a virtual community that has progressively acquired flesh and bone. The body is now strong and fit. We can talk face to face and it makes interaction much easier and much more productive." The Director of Agence Iter France, Jacques Vayron (far left), leads the traditional tour of the exhibition stands. The European Commission's Gerassimos Thomas, Deputy Director-General for Energy; mayor of Antibes Jean Leonetti; Fusion for Energy Director Johannes Schwemmer; Daniel Sfecci, representing the Nice-Côte d'Azur Chamber of Commerce and Industry; and ITER Director-General Bernard Bigot listen to representatives of the engineering group Assystem. As at all previous editions, IBF-19 began with a series of introductory presentations that highlighted progress accomplished and challenges to come. Following a general introduction by Jacques Vayron, the director of Agence Iter France, ITER Director-General Bernard Bigot compared ITER to an extremely complex Lego construction, saying that "if one single piece, however small, is missing the whole project will suffer." Gerassimos Thomas, the Deputy Director-General for Energy at the European Commission, acknowledged that, "thanks to Director-General Bigot and with the help of the Domestic Agencies and all stakeholders, the project has dramatically turned around. [...] We now have an impeccable case to support ITER." Jacques Vayron, Director, Agence Iter France: "Agence Iter France, and particularly the ITER Industrial Committee, is developing and maintaining the permanent link between industrial companies and the ITER Project. The ITER Business Forum is a key event for this purpose." 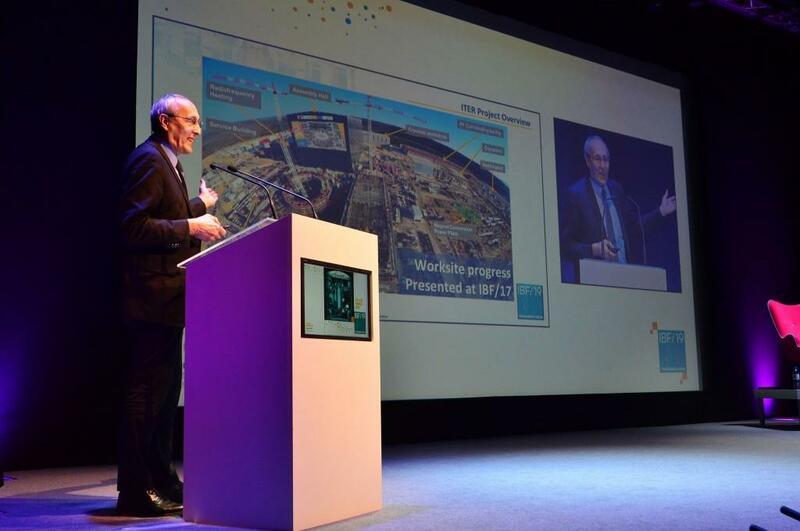 Bernard Bigot, Director-General, ITER Organization: "My hope is that by 2040, five years into ITER full-power operation, utility companies will get involved and that by 2055 we'll have a first operational hydrogen fusion power plant connected to the grid." Gerassimos Thomas, Deputy Director-Director for Energy, European Commission: "We wouldn't be where we are now if we hadn't worked as partners within a team." Gyung-Su Lee, Chief Operating Officer and Deputy Director-General, ITER Organization: "What is ITER? First and foremost, ITER is people. Not just from the ITER Organization or the ITER Domestic Agencies, but the thousands of people who contribute to the project throughout the world." Luo Delong, Head of ITER China: "In China, everybody knows about ITER ..."
Johannes Schwemmer, Director of the European Domestic Agency, Fusion for Energy: "Between 2008 and 2017, ITER has created 40,000 jobs/year in Europe. We are expecting more than double this number in the coming years." Anatoly Krasilnikov, head of ITER Russia (on the next-step machine): "We consider that a hybrid fission-fusion reactor is a reasonable step." 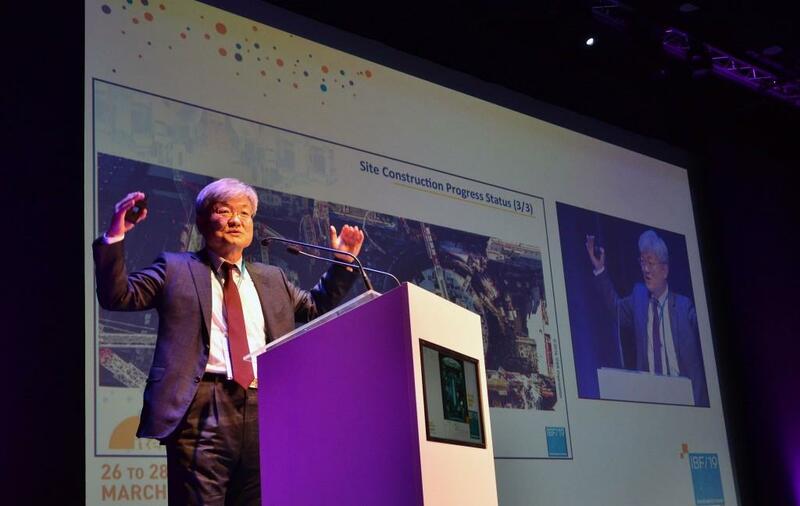 In a passionate demonstration of how ITER was "making history," ITER Chief Operating Officer and Deputy-Director General Gyung-Su Lee described the inevitable "uncertainties and unknowns" of a first-of-a-kind machine but promised the audience that they would soon be "listening to the beautiful sound of neutrons"—the heavenly music of fusion "tamed and utilized to generate energy." Representatives of each of the seven ITER Domestic Agencies took the stage in quick succession describing, sometimes with humour (and always with precision and conviction) the challenges faced and the accomplishments achieved. "The future will be painted by you," Gerassimos Thomas told the hundreds of industry representatives gathered in the amphitheatre on the first day of IBF-19. Through technical presentations, workshops and one-to-one meetings, it was soon clear that the "future" was reaching far beyond ITER. "We need to have as small a gap as possible between the end of ITER assembly and the engineering phase of DEMO," stressed Tony Donné, Programme Manager for EUROfusion. "Too large a gap would lead to the loss of industrial interest and expertise that is critical for the next-step machine and the future of fusion." What IBF-19 demonstrated is that the relationship between ITER (and more broadly fusion) and industry has now reached a turning point. Beyond the experimental machine that is ITER, a whole new field of activity and innovation—encompassing hundreds of different technologies—is now opening before hundreds of companies throughout the world as the steps after ITER are being planned. And at the same time, the very role of industry is being redefined—graduating from "supplier" to "partner." In Europe, dozens of companies are already involved in the conception of DEMO; in China 30 different entities, both industrial and academic, are at work on the China Fusion Engineering Test Reactor (CFETR)—a "super ITER" that will evolve into a fusion reactor near-prototype, and whose engineering design is set to be completed in 2020. Since its relatively humble beginnings in 2007, the ITER Business Forum has been a key facilitator in this process. Click here to view a video walkthrough of IBF-19. ¹With the participation of ITER Organization, Fusion for Energy and other Domestic Agencies, and with the financial support of local authorities. 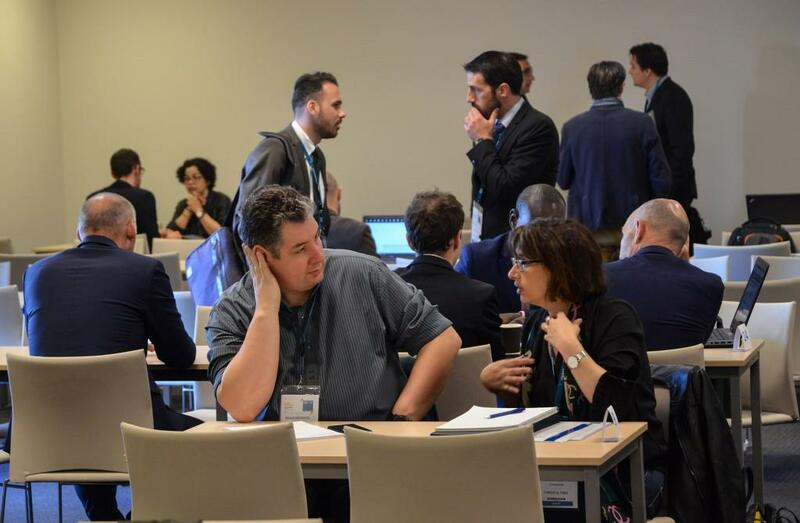 "We have established a new record"
"Following the 2017 edition of the ITER Business Forum in Avignon (France) we thought we had reached our maximum possible attendance," says Pierre-Marie Delplanque, interim director of Agence Iter France. "But this year in Antibes we established a new record with 1,110 participants from 484 companies. We also had 80 exhibition stands and more than 1,200 formal 'business-to-business' meetings—and this does not include of course the informal interaction that took place during coffee breaks, buffet lunches and seated dinners. Along with the entire Agence Iter France team, Sabine Portier (Industry Liaison Officer) and her deputy Philippe Olivier are to be especially commended. We now have to do as well or even better for the upcoming edition of IBF in 2021—and preparations begin now." 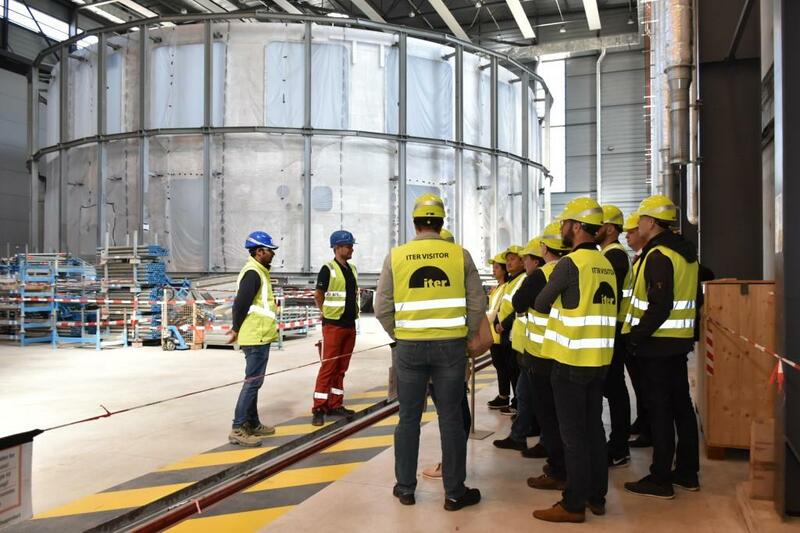 One day before the start of the event, participants had the opportunity to travel to ITER for a site tour. Here, one group stands in the Cryostat Workshop in front of the completed lower cylinder of the cryostat. 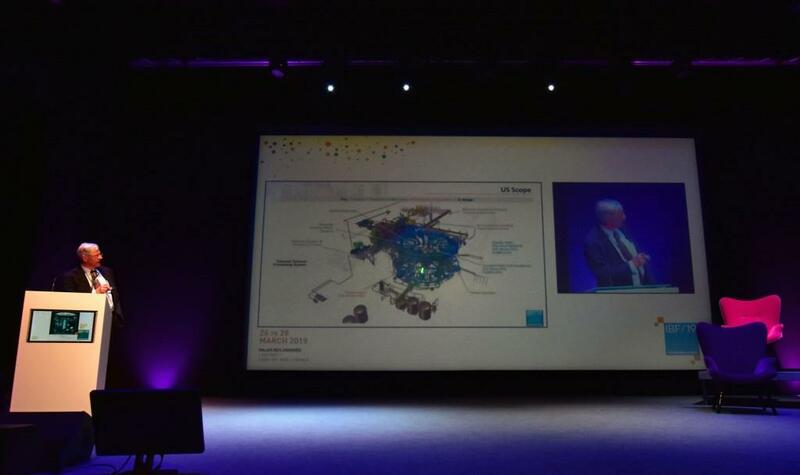 ITER Director-General Bernard Bigot asked the audience to consider the number of companies, universities, research centres and laboratories involved in the ITER Project worldwide─at least 1,000 by his count. "Going forward, we will rely more than ever on all our partners to deliver components and services of the highest quality, according to specification, according to budget, and on time." One of the main attractions of the ITER stand was the virtual reality tour of the ITER worksite. 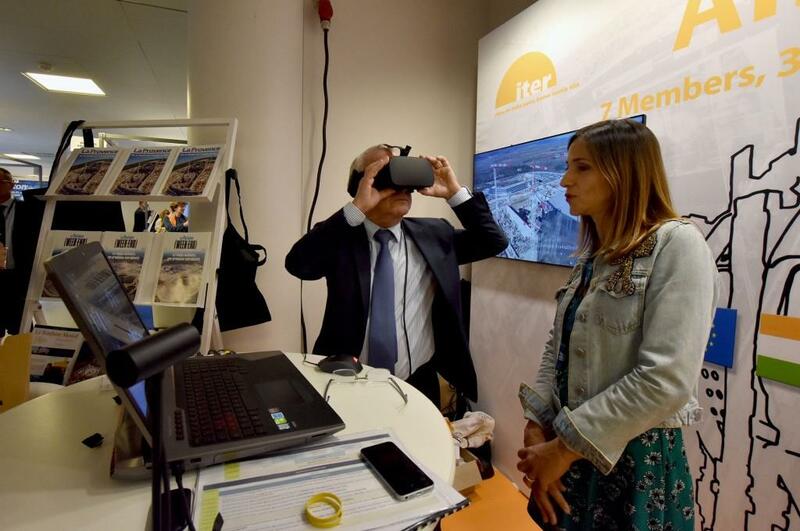 Here, Julie Marcillat of the ITER Communication Team is guiding the mayor of Antibes, Jean Leonetti, through the unforgettable "immersive experience." "A giant cooling system with a small tokamak in the middle"
The ITER cooling system is so complex and expansive that Ned Sauthoff, head of US ITER, humourously described the installation as "a giant cooling system with a small tokamak in the middle." The ITER Business Forum is all about meeting ITER stakeholders and hearing updates on progress and upcoming tenders. But is also about promoting partnerships between industries through "business-to-business" meetings—and there were more than 1,200 of those during the two-day event. Laurent Schmieder (centre), Fusion for Energy's Project Manager for Buildings, Infrastructure and Power Supplies, is letting interested parties know about upcoming tenders related to building construction—for example the construction of the ITER Hot Cell Facility, needed for later-stage operation. For the first time in the twelve-year history of IBF, a delegation representing Canadian industry participated in the forum. Pictured here are representatives of the Organization of Canadian Nuclear Industries (OCNI), SNC-Lavalin/Nuclear, Ontario Power Generation, and several other firms and organizations. 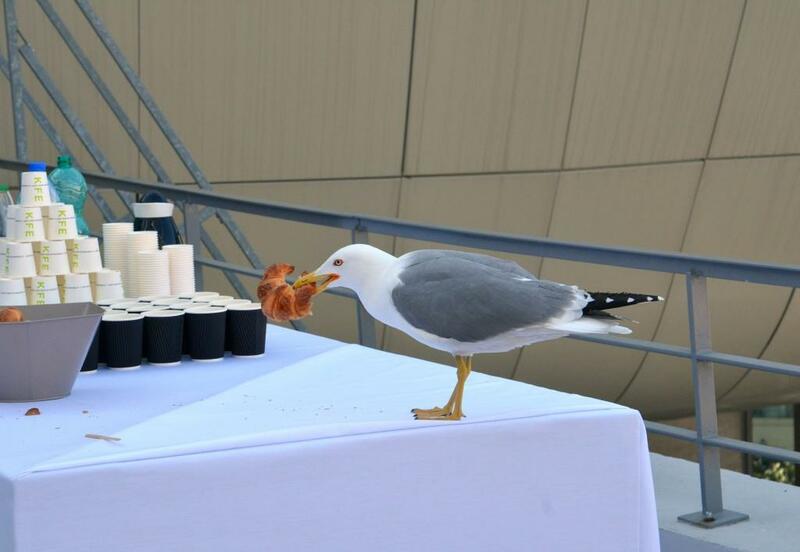 Coffee breaks on the terrace overlooking the Mediterranean provided seagulls with an opportunity for breakfast, free of charge.